LEDs connected to buttons (through screw-terminal connectors) This kit supports open drain outputs with max. 5 mA per output. Using the internal supply, a maximum of 100 mA can be sourced for all outputs. 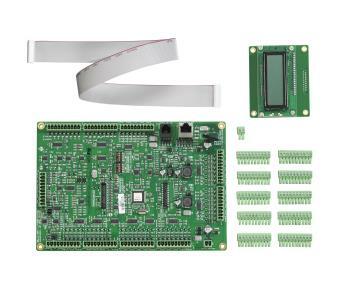 The kit also provides an external power supply for lighting LEDs of external normal buttons. 2 connections (VCC & open collector) are available for each LED connected to a button. In total, 38 LEDs share 10 common MIX_PWR_LED. These LEDs are supplied with 5 V DC using the internal power supply. The connected LEDs are supplied with 24 V DC using the external power supply. Each LED circuit has short-circuit protection.